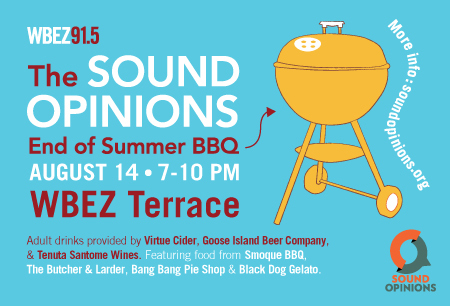 Sound Opinions is throwing an End of Summer BBQ on August 14 at Navy Pier’s WBEZ Terrace. Tickets are $40 and includes BBQ, dessert and alcoholic beverages. The food will be provided by The Butcher and Larder, Smoque BBQ, Bang Bang Pie Shop and Black Dog Gelato. Vegetarian options also available. Meanwhile, drinks will be courtesy of Virtue Cider, Goose Island and Tenuta Santomè. The event will run from 7p.m. and will end in time to watch the Navy Pier fireworks starting at 9:30 p.m. Listen to Sound Opinions here.